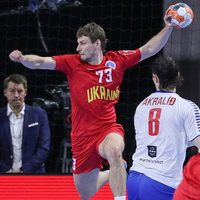 Fans in Royal Arena, Copenhagen saw the premiere of two EHF EURO Qualifiers in a row: First, Faroe Islands gave Ukraine a great fight, but were closely defeated, then Denmark took clear revenge for their sensational 31:32 defeat in Montenegro on Wednesday. Saturday’s victorious sides now top the Group 8 ranking with six points each, ahead of Montenegro on three and Faroe Islands on one. Even seven goals from Kjartan Johansen were not enough for Faroe Islands to cause an upset against Ukraine. The match was on the edge for 60 minutes, with light advantages for the visitors, who led most of the way but could not cast the Scandinavians off. Faroe Islands had their best period at the end of the second half, after Ukraine had turned a 12:14 deficit into a 15:14 half-time advantage. The match was fully open until minute 53 and the 24:23 intermediate for the hosts, then Ukraine struck back with a 4:1 run to decide the duel. The top scorer was Vladislav Ostroushko with nine goals, who now has a total of 23 in his tally. Thanks to their third straight win, the visitors made a huge step towards the EHF EURO 2020, thought they had a much tougher job compared to the 30:19 win against Faroe Islands on home ground. It only took 11 minutes to prove that the defeat in Montenegro was a singular failure for the world champions. At that point, Montenegro coach Zoran Roganovic was forced to take an early timeout, as his side were down 2:7. But nothing changed immediately, as the hosts even pulled ahead to 13.6. The reduction of the gap to the half-time score of 14:11 was the last sign of life of the visitors in this one-sided revenge. Denmark took full control again after the break, and the decision was made at 28:20 10 minutes before the end. 33:23 saw the first double-figured advantage for the hosts, who were not endangered at any time in their first match in Royal Arena after the opener of the World Championship in January.